Why Don’t We Believe in Allergies? Today, I was incredibly moved by a post on the blog A Tale of Anaphylaxis. The author, epipenprincess aka Sydney, is a student who has quite a few anaphylactic allergies. In her latest post, she talks about how after a recent bout of anaphylaxis, some people were talking behind her back about how she was overreacting and making it all up. I was so moved because it reminded me so much of countless experiences I’ve had where people just flat out didn’t believe me. I know that a decade ago, I was a high school student with severe allergies and I made it through just fine, but I’m still in such admiration of Sydney’s bravery to not only handle the so-called “haters” but to do so the day after a reaction, on a blog, and with a positive attitude. That doesn’t sound to me like the sort of person who makes up allergies to get attention, or overreacts to things willy-nilly. Her immune system might overreact, but that’s about it. And for people to be gossiping about her while she’s sick – it’s disgusting. Somehow, I can handle this ridiculousness when it happens to me (most of the time, I do get riled up sometimes), but hearing about it happening to someone else just infuriates me. There’s this fad to not believe in allergies. Allergy agnosticism, if you will. I get not believing in trolls, or leprechauns, or unicorns (though I sort of believe in unicorns). But allergies? That’s absurd. It’s not a thing to not believe in. Why do we believe in cancer or heart attacks or ADD but not believe in allergies? Because the idea of allergies is so crazy that we don’t want to? We can’t fathom living in a world where something harmless to us is actually a killer to some people – we decide we don’t like that notion – so we assume the person is crazy? If you can’t experience something first hand you don’t think it’s real? I wonder if the logic goes, “I could have a heart attack someday, so that’s real. But I have no history of an allergy, so anaphylaxis is probs fake.” This attitude – which, honestly, I think is pretty illogical – is also dangerous. What if Sydney were younger and not in tune with her body enough to know she needed help? I’ve been there. Thankfully, I never stopped breathing until a couple months ago, but I definitely had times where I didn’t take care of myself properly because I was convinced I was crazy. And why? Because enough people had told me I was crazy. I remember one high school experience in particular. I was at a weekend seminar for school, and even though I asked the caterer what was in all the food, I mistakenly ate pasta with mushrooms. Once I found out there were mushrooms in the pasta, I kept eating it, because I had never tried mushrooms and thought there was no time like the present (oh, how my doctor would flip out now if he knew). I started feeling hazy and weird, and told my friends I needed help. At the time, I didn’t carry benadryl with me, because I didn’t react that often. There were no real rules about epipens and all that. So, we get the EMT and tell him what’s going on and that I need benadryl. He didn’t have any (also something that wouldn’t happen these days, I hope), and before he sent someone to get some, he “examined” me. At this point, I was freaking out that I wasn’t going to get medicine fast enough. I started having a panic attack, but when your throat is tight and you feel sick and you’re on the lookout for anaphylaxis, a panic attack isn’t the best idea. The EMT told me he thought I was only having a panic attack, and I assured him that panic attack or not, I was having a reaction, and that it was either getting worse or I was indeed panicking, but either way, I needed benadryl stat. Someone eventually ran out and bought some, I took it, and they sent me back to my room. I felt better after the benadryl, and thank God didn’t need epi. I remember another girl from my school who had a lot of allergies came to my room and calmed me down. She said she had heard what happened, and that no matter what anyone said, I knew if I was having an attack, and that if I needed anything, she had allergy meds with her and would help me if I needed to go to the hospital. She wasn’t a good friend of mine, more of an acquaintance classmate, but it meant the world to me that she helped me. I hated that people had been talking about me behind my back – I’m sure, like Sydney’s peers, they were saying not so nice things – but this girl weeded through that to support me. When my school’s professionals were lax, inattentive, not taking me seriously (and making it worse by doing so, as the longer I waited for the benadryl, the more scared I became, hence the panic attack), my friends and this girl had my back. I don’t know if the EMT didn’t believe me, or if the caterer didn’t believe me when I asked him what was in the food, but I know I wasn’t taken seriously, even though it was serious. It’s not a minor incident when you start to lose your eyesight and train of thought because of a food. It’s not as serious as not breathing, but it’s not a walk in the park either. It’s not just the EMT who didn’t have his act together. The doctor at my college actually told my primary care doctor that she didn’t think, as a general rule, that allergies were real. I often have meals with people who think I’m making it up. People who say that no one outside of America has food allergies (except that Canada and other countries actually have better allergy laws, so I imagine they have citizens who require said laws). The first allergist I saw in LA didn’t believe in my food allergies even while she was testing me, but to her credit, she did believe in my environmental allergies. I feel ridiculous typing that, but she actually said to me, “sometimes people think they have allergies, but really they just have exhaustion.” Oh, so I was exhausted when I was being breastfed, and just never recouped that sleep in 26 years? Then she suggested I had an ulcer. I do get ulcers from some medicines, and I can tell you, they feel nothing like your throat swelling, hives, loss of vision, and shortness of breath. She’s an allergist and she didn’t believe in my allergies. I can go on and on about people who have questioned me. That said, there are more believers than non-believers. The way I’m learning to deal with these people who think I’m crazy is by focusing on the people who know I’m not. My friends who encouraged me to see an allergist and get treatment. The people who go out of their way to cook meals I can eat. The people who wash their hands every time they come to see me in case they just ate something I can’t have. The people who have taken me to the hospital. Who have talked me through taking medicine when I need to. Who look at menus when we go out to eat or when they order in and get something that’s easier for me to be around. My current doctor and his team of nurses who continue to educate me and go out of their way to check in on me when I’ve had an attack. And all of you who read this blog. Sure, the non-believers put my life in jeopardy. They make it hard. There’s no excuse for them. But ultimately, they don’t matter. I know the truth, and the people who are important know the truth. Allergies aren’t something you can believe in or not believe in. They aren’t something to joke about or make fun of or disregard as unimportant. And while it’s exhausting to both have anaphylactic allergies and be brave, I’m going to take a page out of Sydney’s book and brush off the “haters,” and just keep on trucking, safely. There are some foods you don’t think you can make yourself. Foods that you associate with dining out. And once you stop eating out, you think, “Ok, I will live the rest of my life without this food, and that’s just how it is.” It’s sad, but it’s really a waste of time to be sad about food. For me, gnocchi was that food. I’m not sure why. I guess I just always loved ordering it in restaurants, so I just associated it as a special restaurant treat. It’s not so! Gnocchi is totally an easy home food. And – spoiler alert- made a fantastic dinner tonight. I decided to make the dish because we’re editing a cooking show at work, and in the episode currently in edit, the chef is making gnocchi. I found it utterly impossible to spend the day hearing about gnocchi without developing a serious craving. I couldn’t think of any other food that was worth eating. I needed gnocchi. I figured since the chef on the show could make gnocchi in her home, I could, too. I googled it, and turns out it’s ridiculously easy. I followed a simple recipe from All Recipes (though I used 2 eggs to get the consistency I needed, and made the balls with my hands instead of rolling the dough out), made homemade sauce, melted on string cheese, and had a delightful restaurant-esque dinner from the comfort of my couch. More importantly, I learned something: there is no reason people will food allergies who have to restrict their dining out can’t have restaurant food. Cooking is easier than we think it is. Sure, some things have serious prep time, but a lot of that can be done while multitasking — I washed dishes that were long overdue while my potatoes boiled, for example. This morning I roasted chicken and pears while I got ready for work. Yes, the dish takes 40 minutes to prep. Luckily, it takes me 40 minutes to get ready in the morning, if I decide to eat breakfast. Cooking doesn’t have to be a whole “to-do.” But there’s no reason you can’t do it. I was totally empowered by my gnocchi experience. Plus, I made a few servings worth, and now I have lunch and then some. And all it took was some googling and half an hour of my time (including letting the potatoes boil for longer than they needed to). It would have taken the restaurant that long to bring me the food, plus it would have cost more and I wouldn’t have had leftovers. (Or dishes, but hey. You can’t win them all). While restaurants are nice — I am going out to dinner tomorrow — a home-cooked meal that’s outside the box is somehow more satisfying. 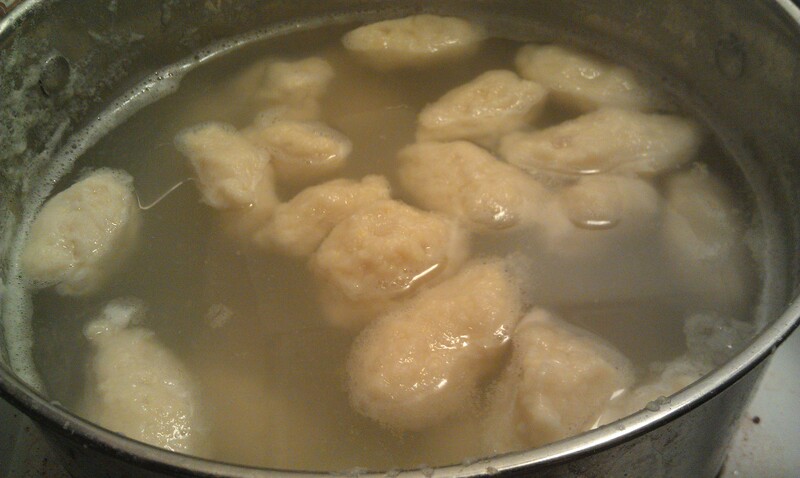 Gnocchi boiling in my pot. Who knew mashed potatoes rolled into flour and eggs and boiled for 5 minutes could be so darn delicious? 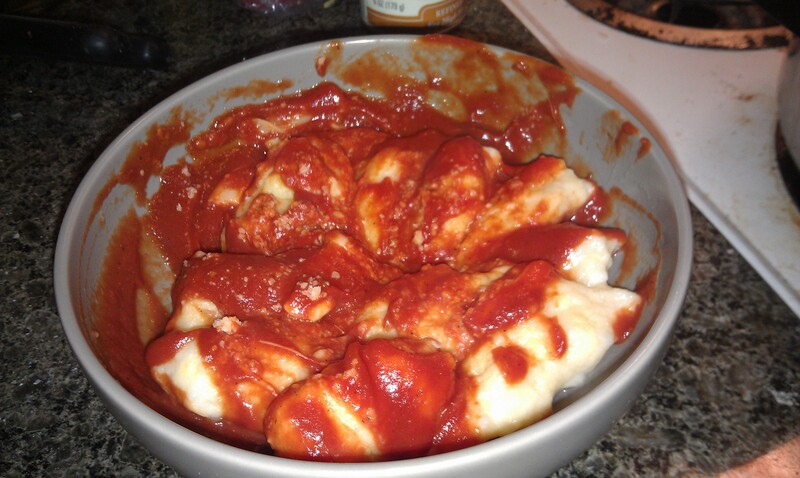 Gnocchi, tomato sauce, and cheese. The best dinner ever. If I wasn’t half asleep I’d probably expand on this post a little more, but Howaboutwe’s Marla Pachter has it pretty much covered. Love her sense of humor about how awkward it can be to go on dates with a ton of food allergies. Read her article here. It’s hilarious. 1. You’re not supposed to mention things like weird illnesses or awkward dealbreakers on a first, or even second date. It’s like, everyone has their thing, but you don’t need to broadcast yours to the world like it’s a bright red flag. So if my thing is food allergies, how do I not do that on a first date that’s dinner related? Yes, we can go to drinks or minigolf or the beach but if some guy says “Hey Cindy, I want to take you to dinner” and I say “Howaboutwe go minigolfing instead?” I’m sure he’ll say why, and then it’s like, do I lie? Do I say, “I just prefer minigolfing” and come off all weird and high maintenance? If it goes somewhere, he’ll find out that dinner’s hard, so there’s no use pretending it’s not. I guess I just have to be the girl guys don’t want to take to dinner. I have to give off a minigolfing vibe. Maybe invest in some polo shirts and golf cleats. 2. I have totally suggested a guy order food I was allergic to while on a date so that he would fail when he tried to kiss me. True story. I was all, “yeah, you should order that mushroom pasta, mmmm it sounds so good” when he was debating between that and the dish I was having and then later I was like, “oh no! so sorry, you had mushrooms, let’s just wave goodbye…” Sometimes, you know at the start of the date where it’s going, and I saw it was going nowhere, and got myself out of what could have otherwise been an awkward head-tilt that’s only good for my amazing masseuse May. So, there’s a plus side to dating with allergies.